To recreationally dive for lobsters in Massachusetts, all divers must hold a Recreational Lobster/Crabbing Permit endorsed for diving. A permit endorsed for diving only covers the individual and does not cover the immediate family. Each individual diver must hold their own permit endorsed for diving. This permit must be carried on the vessel at all times when fishing for lobsters. No permit is required for the taking of edible crabs by diving. The taking of edible crabs is subject to recreational crab regulations (Recreational Lobster & Crabbing Regulations). 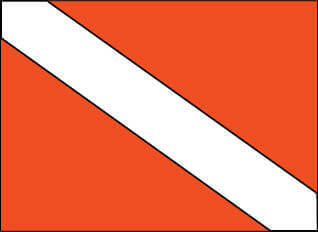 Dive Flag – MA law requires each diver or group of divers, while swimming or below the surface, to display a dive flag. The dive flag must be at least 12″ x 15″ in area with a red background and white diagonal stripe. The flag must be displayed on the vessel or on a surface float and must extend at least 3 feet from the surface of the water. Divers are required to stay within 100 feet of the displayed flag while at or near the surface. Divers may display their permit numbers of their dive flag. Dive Marker – If the permit number for all divers is not displayed on the dive flag, a dive marker must be used. The dive marker must be a 12″ x 12″ floating panel with a white background. The permit number for each diver must be displayed on each side of the marker in numerals measuring 3” in height by ½” in width. Dive Tank – The permit number must be marked on your dive tank in numerals that measure 3″ in height by ½” in width. Divers may take lobsters by hand. They may also utilize a tickle stick, which is a straight or slightly bent stick used to agitate a lobster to come out of its hole. The use of spears, snares and dipnets is prohibited (Recreational Lobster & Crabbing Regulations). There is a limit of 15 lobsters per day per permit, and all lobsters must meet the legal requirements. Divers are required to measure all lobsters in possession prior to surfacing. Taking of blue crabs and other edible crabs is prohibited from January 1 through April 30. There is a limit of 25 blue crabs per day. There is a combined limit of 50 edible crabs (e.g., blue and Jonah) per day.